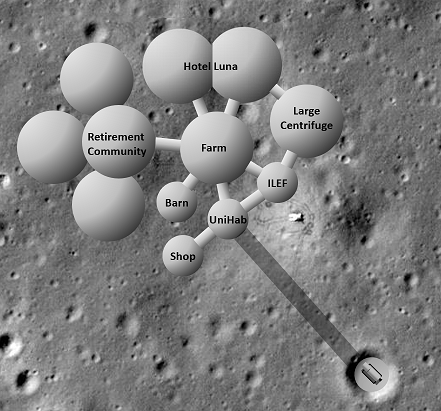 During the phase when international teams come to explore the Moon, there would also be cargo missions that would deliver more inflatable habitats. A 20 metric ton payload could deliver an inflatable skin with a surface footprint of 2.3 acres. Later deliveries could deliver portions of the Kevlar lattice, and inner layers necessary. The point is that, during the base expansion phase, very large structures could be set up. Individual, large habitats could be dedicated to certain infrastructure services such as life support production, sanitation, manufacturing, chemistry, farming, a larger centrifuge, recreational areas, dining hall, and clinic. Masten Space Systems is a relatively small company which, none-the-less is the leader in small-scale vertical take off - vertical landing rocket modules. The work that they do is amazing! ULA has lent a couple of Centaur upper stages to Masten Space Systems in the hope that they would attach four vertical modules onto the large Centaur tank and develop it to the point where it would demonstrate the full propulsive maneuvers required for a terminal lunar landing. Dave Masten has indicated that it would take only 1.5 to 2 years and only about $20 million to pull off the terrestrial demonstration of a full-scale Xeus lander flying over the skies of Mojave. If NASA were to fund this Terrestrial Demonstrator, it would go far to convince all that we really could send full-scale lunar landers to the Moon in the near-term and in a very cost-effective manner. It is estimated that the development of the launch-ready lunar lander shouldn't take more than $200 million to develop. This is half of what it cost to develop the Falcon 9 rocket which was developed for about 1/8th the cost had it been done using the traditional NASA contracting approach (cost plus). Yet it makes sense that the Xeus should cost less than the Falcon 9. The RL-10 engine is already developed and well proved. The Xeus wouldn't have to undergo the staging nor the same maximum aerodynamic pressures of the Falcon 9. The Plan for Sustainable Space Development shows a path from the first habitat to full settlement.